Now that fall is embracing us with greyness, wind and rain, it’s getting cosy and people find more time to read. The perfect moment to present our new column “Daily Business for a…”, which aims to give potential applicants an overview of the diverse working areas in the games industry. For this purpose, we will regularly ask employees from different companies with the most diverse of occupations to tell us about their jobs, daily duties, working life and careers, as well as their promotion opportunities. We are happy to welcome Geraldine Feidner, Senior HR Business Partner and Melanie Kohwagner, HR Team Lead and Business Partner at Travian Games, as the first to participate and answer our questions. Games-Career: What is the job of an HR (Human Ressources) Business Partner? Geraldine Feidner: That is always a super difficult question to answer shortly, but we will try: We especially support the Travian Games Managers in a lot of matters concerning their teams and also consult any Travian Games colleagues on HR related matters, e.g. our benefits. We work closely with our HR colleagues specialised in recruiting, relocation, onboarding processes and employer branding. We support when requests arise concerning the development or the career of colleagues or team members. We facilitate the biannual Appraisal & Objective Interview process, moderate the performance review process and take care of other development initiatives. We plan inhouse trainings and advise on external training possibilities. The managers consult with us on a variety of employee relation topics, such as legal matters, motivational measures, performance related topics and sometimes also how the company can help an employee that is in a tricky private situation. In our philosophy the people are first and it‘s them, who make us successfull. We focus rather on the individual, which allows to find personal solutions instead of just applying a standard where it doesn’t suit. 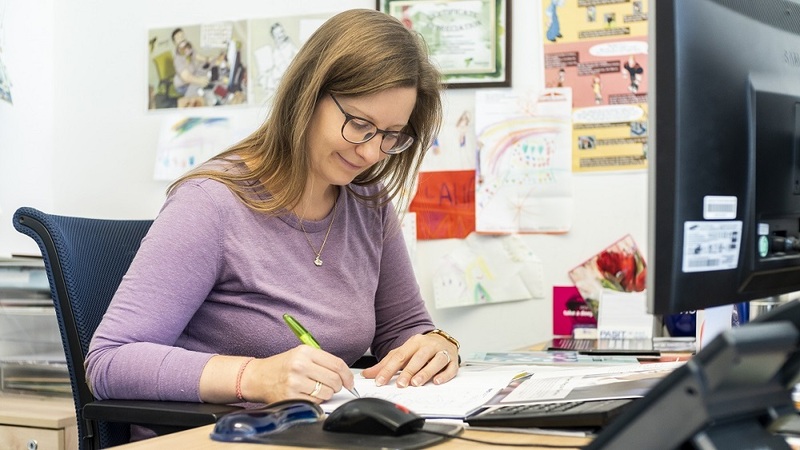 Whenever any colleague has any HR related question, they approach us in our HR office and the person best suited will help – be it an HR Business Partner or our HR Administrator, Recruiter or Melanie as HR Team Lead. Besides our daily work, we also always work on different projects and have different specialisations. And we oversee the monthly payroll. Games-Career: What typical activities do you perform? Melanie Kohwagner: Funny question, but we typically communicate a lot – in meetings, in weekly Jour Fixes with the managers of our assigned departments, answer all kinds of HR related questions, research information and consult with each other inside the HR team. Besides we write quite some documents like contracts or supplementary agreements. We moderate the yearly performance review and present the HR portfolio and the benefits to our new starters..
Games-Career: How do you become an HR Business Partner? Geraldine Feidner: There are various ways to become what we are . To name just the few we have in the team: By finishing an apprenticeship as trained hotel professional and afterwards adding a Bachelor in HR Management. Typically, you could also study Business Administration, with a focus on personnel management. Afterwards many start with an HR Administrator role or as an HR Assistant and make their way up to an HR Business Partner role. Another possibility is to get a Bachelor or Master in Work & Organizational Psychology and add some internships in HR departments in different industries. Games-Career: Which graduation is required to become an HR Business Partner? Melanie Kohwagner: As described above, there is not one way but different ones to become an HR Business Partner. Besides the necessary professional knowledge you should like to talk with people, be open and not too shy and also be willing to be a sparring partner for managers. It is always helpful if you are interested and have some knowledge in many areas concerning HR in a company, like recruiting and leadership consulting, development and work & organizational law, HR administration, payroll & benefits and relocation… That does not mean you have to be proficient in all these areas – but at least to have an inkling what these all are about. Games-Career: What are the sunny sides of the job? Also to go ahead in one´s own development – e.g. getting more experienced and knowledgable about coaching managers. And by working at Travian Games we also learn a lot about modern ways to do team work and that agile environment also inspires us in HR. Games-Career: What are the dark sides of the job? Geraldine Feidner: Sure there are some. Receiving a letter of resignation or terminating a contract from our side is never easy. Sometimes even the best plans don´t work, or colleagues aren´t willing to accept any change or development and thus, even seasoned HR business Partners get demotivated. Games-Career: What career prospects does an HR Business Partner have? Melanie Kohwagner: As an HR Business Partner you work on a broad operative and strategic level. One of the prospects can be to increase the strategic focus and develop towards a Senior HR Business Partner role. Another prospect could be to focus on specialisation and become an expert or consultant in your chosen field, e.g. compensation & benefits or recruiting or employer branding. Or you can concentrate on the managerial career path and become an HR Manager. Another possibility would be to become self-employed with a consultancy focusing on HR topics you are really good in and passionate for, e.g. business coaching or training. Games-Career: Which opportunities of further education and promotion does an HR BP have? Melanie Kohwagner: Possibilities of further education are endless, as there is such a variety of tasks. But to name a few, there are trainings in labour law or coaching trainings (with a focus on business or also including the therapeutical side). There are also training programs about HR strategy and organizational strategy with focus on HR. Games-Career: Wow, a very diversified profession with the possibility to deepen one’s knowledge in whatever (of the mentioned) focus, you feel comfortable with – as long as you love working with people… Thank you, Ladies, for these detailed insights! In terested in working at Travian Games yourself? Find all recent job opportunities on the company profile.